Enchanted by the success of technical inventions, humanity creates new tools, machines and algorithms. They work more or less autonomously and bring active transformations of spaces. In this project, we refer to the concept of “field”. The collective image of the field is a symbol of the space of vital opportunities, emptiness and freedom. On photogrammetric models of real landscapes, algorithmic structures are being created. The surface of the landscape is analysed and its outlines become the basis for the construction of abstract forms. The concept of “field” is juxtaposed with the image of the algorithmic process, seen as a metaphor for technological progress. The digital environment makes contact with reality. Observing how the algorithm creates the forms on the field, one can see how the landscape is changing. This symbolic image translates the experience of the dynamics of the present and visions of the future. This work was presented in project of Ars Electronica “Future Humanity – Our Shared Planet”, in collaboration with Hyundai Motor Group. 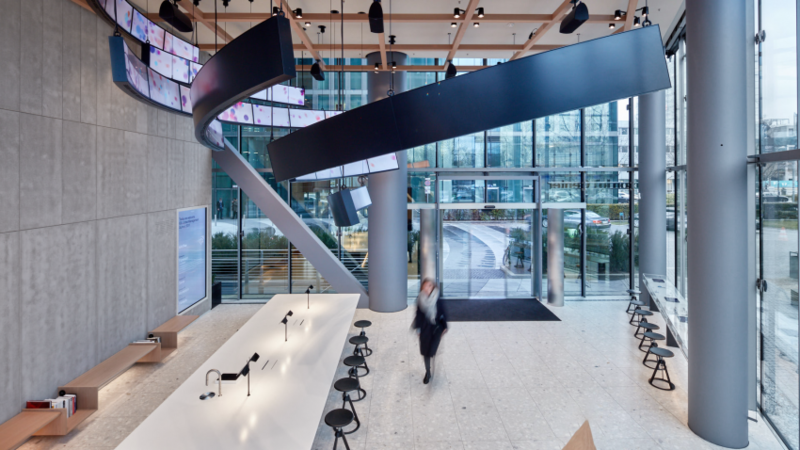 Hyundai Motor Studio, Moscow 2018-19. Presented on the media facade of Eltsin center in Ekaterinburg 1.03.2019. Produced within few hours with vvvv and custom shaders, recorded in one shot as a live VJ mix. Radio antennas in the courtyard of the exhibition venue listen to the vastness of space. The received electromagnetic waves control the installation in the exhibition room. 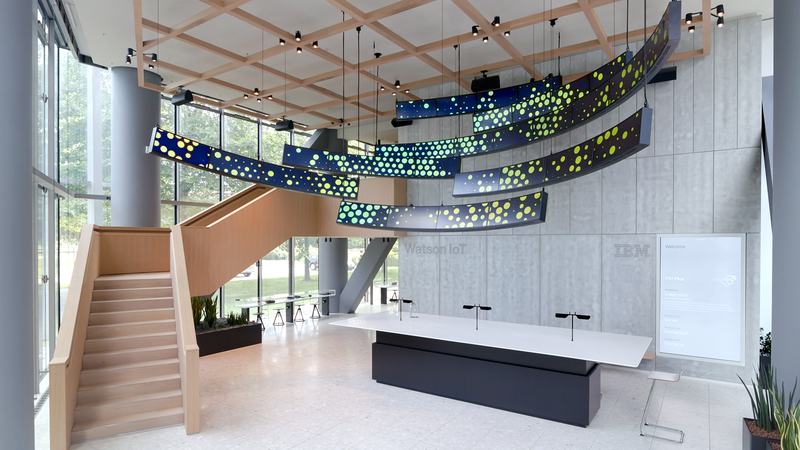 Inspired by spectroscopy, the artwork breaks the astronomical radio beams down into their individual frequencies. This spectrum is distributed to the individual arms of the installation. The intensity of the measured radio waves determine the strength of the amplitude and so the movement and sound. A simple mechanism, based on the properties of a solenoid, is used to strike a small resonating brass plate. By multiplication a small armada of finely balanced, long, narrow arms emerges, rocking gently up an down. The vibrations of space performed as cosmic choreography, as a murmuring,chirring and clacking symphony. The black 2.4mt dish complies with the guidelines for amateur investigation by SETI (Search for Extraterrestrial Intelligence). Since 1960, this term describes various methods of searching for signs of other civilizations in space. The telescope examines the area around the hydrogen line (1420 MHz), a preferred frequency for any radio astronomy and especially for finding intelligent life on alien planets. On the roof of the exhibition venue is a Yagi antenna. It uses a French military radar system called GRAVES, which sends radio waves from the ground into space at the frequency of 143,050 MHz. These are reflected back to earth by high atmospheric layers. This system detects all objects that enter the earth's atmosphere at an early stage. This can be meteorites, parts of reentering satellites or anything else. The data from both radio antennas are read simultaneously in real time and transferred to the installation. Thanks to Florian Huhoff, Sebastian Mühlauer and Anna Diljá Sigurðardóttir. Commissioned by Bauhaus 100 Das Eröffnungsfestival. March 24, 2018 DJ Krush visited Moscow. At the Yota Arena stage, DJ Krush presented two new albums at once - Kiseki, entirely dedicated to Japanese rap, and a new instrumental work, Cosmic Yard. One of the heroes of Kiseki, a Japanese poet, rapper and musician Sibitt, one of the main characters of the modern Japanese spoken word scene, joined the event. For the performance we prepared a special visualization designed to display the sound space and associative connection with the themes of the music compositions. We hope that this recording can convey a part of the exceptional atmosphere of the concert. Many thanks to Ilya Rasskazov and Headz.FM for making this happen. Carl Laemmle, the founder of Universal Pictures, is considered one of Hollywoods most important film pioneers. After Hitlers rise to power in 1933 he dedicated his life to saving as many Jewish Families from Nazi Germany as possible. We had the honor to develop an interactive exhibit bringing the visitor to Laemmles desk diving into some of those touching stories by browsing Laemmles correspondence. Second Litany from the List í ljósi - Art in Light Festival 2019. The projection went well, locals loved it and that is always the most important thing - to use the environment and make the work become one with it! Big thanks to organization team for calling me in and making this happen! Any talented artist can try enter the open call on listiljosi.com. This piece is about relating dance to religious experiences, how it can facilitate them and pose as a spiritual part of people experience without relying on specific dogma. With more than 200 hours of radio history, transmitter stations, mobile handhelds, and a wifi-based tracking system. We created an acoustic parcours inviting visitors to dive into 100 years of radio history in close collaboration with Nathalie Singer, Professor for Experimental Radio at Bauhaus Universität Weimar, the artist, architect and musician Cevdet Erek and the exhibition spaces Haus der Kulturen der Welt in Berlin and Museum Tinguely in Basel. In times of 4k and even higher resolutions, the pixel vanishes.It becomes a thing of the past. Think again, with 756 pixels, 3 color channels and 20cm depth. It's a canvas which feels totally different in terms of movement, speed, sound and light composition. It breathes, it is a living, yet mechanical thing, communicating with it's surrounding. The EQ Teaser was designed by Atelier Markgraph (Christoph Diederichs). wirmachenbunt (Christian Engler) developed the software, interaction and motion graphics. Big thanks to vux & colorsound for support. In times of 4k and even higher resolutions, the pixel vanishes. It becomes a thing of the past. 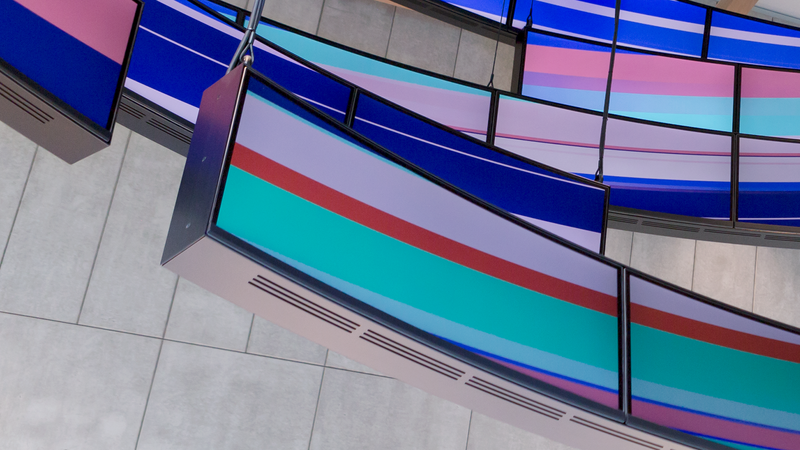 Think again, with 756 very physical pixels, 3 color channels and ~20cm depth. It's a limited canvas which demands careful decisions in terms of movement, speed, sound and light composition. It breathes, it is a living, yet mechanical thing, communicating with it's surrounding. 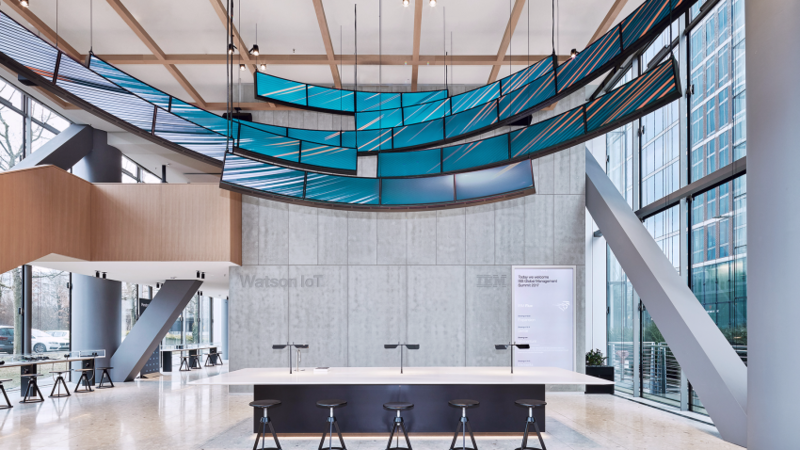 »FLUX« is a data-driven art installation visualizing the different facets of the Internet of Things and cognitive technologies. 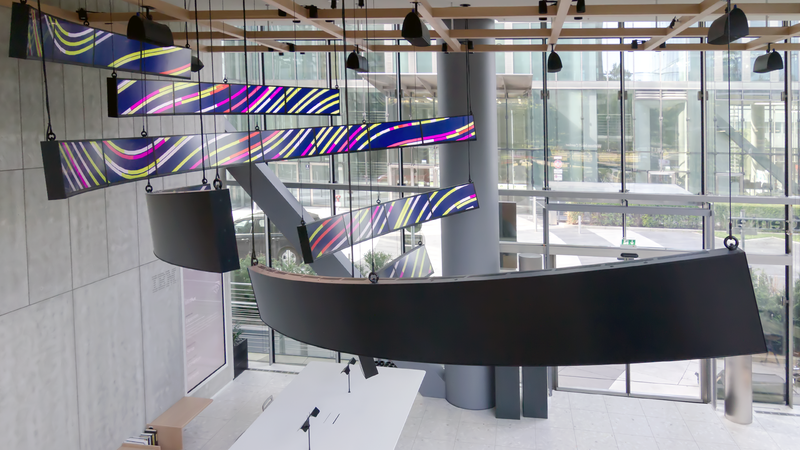 Through four unique visual modes, the sculpture cycles through mesmerizing imagery created through streams of living data. 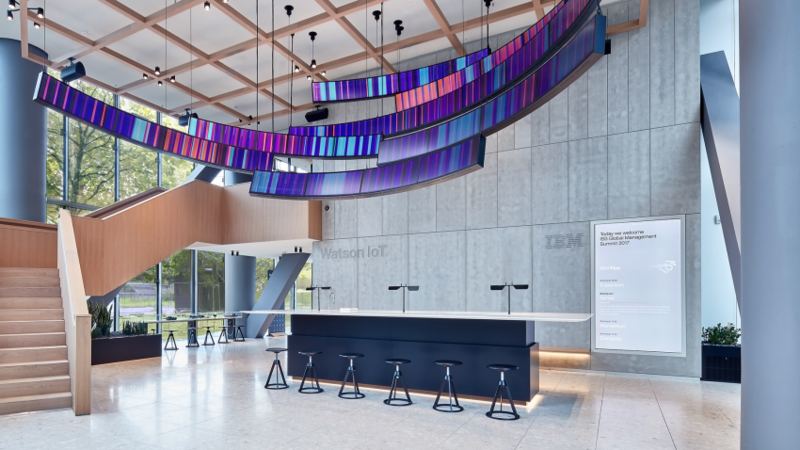 Intelligently engaging with its viewers, the piece is a focal point of the IBM Watson Headquarters, Germany.